American Mystery Classics, 9781613161012, 312pp. Now retired from the tour circuit on which he made his name, master magician The Great Merlini spends his days running a magic shop in New York's Times Square and his nights moonlighting as a consultant for the NYPD. The cops call him when faced with crimes so impossible that they can only be comprehended by a magician's mind. In the most recent case, two occultists are discovered dead in locked rooms, one spread out on a pentagram, both appearing to have been murdered under similar circumstances. The list of suspects includes an escape artist, a professional medium, and a ventriloquist, so it's clear that the crimes took place in a realm that Merlini knows well. But in the end it will take his logical skills, and not his magical ones, to apprehend the killer. 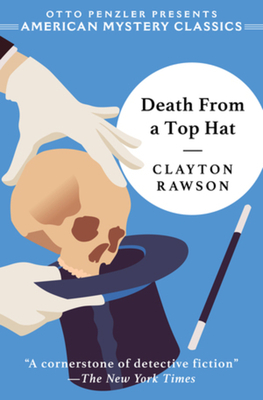 Reprinted for the first time in over twenty years, Death from a Top Hat is an ingeniously-plotted puzzle set in the world of New York stage magic, which was at its pinnacle in the early twentieth century. In 1981, the novel was selected as one of the top ten locked room mysteries of all time by a panel of mystery-world luminaries that included Julian Symons, Edward D. Hoch, Ellery Queen's co-creator Frederic Dannay, and Otto Penzler.